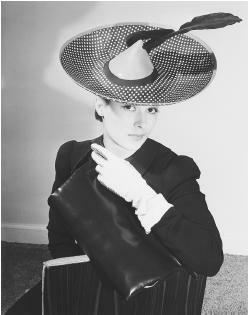 Lilly Daché, spring 1940 collection: polka-dotted foulard hat with quill. closed business, 1968. Awards: Neiman Marcus award, 1940; Coty American Fashion Critics award, 1943. Died: 31 December 1989, in Louvecienne, France. Talking Through My Hats, New York & London, 1946. Lilly Daché's Glamour Book, New York, 1956. Fashion for America! Designs in the Fashion Institute of Technology ,New York, Haslemere, Surry, 1992. "Lilly Daché," in Current Biography, July 1941. "Lilly Daché," [obituary] in the New York Times, 2 January 1990. "Lilly Daché," in Current Biography, March 1990. Lilly Daché was the archetypal flamboyant immigrant beloved of Americans and so often taken to their hearts. In approved rags-to-riches fashion, she arrived in New York with a few dollars in her pocket ($13, henceforth her lucky number) in the heady days of the mid-1920s. Twenty years later, her name was as much a household word as any milliner's could be. Daché's heyday coincided with a period in fashion history, the mid-1930s to the mid-1940s, during which one's hat—one always wore a hat—was often more important than one's frock. Great heights of chic and absurdity were achieved by the milliners of the day: tiny doll's hats perched over one eye, two-tone "Persian" turbans stuck with jewelled daggers, pom-poms of mink or marabout; Daché's hats were amongst the most outrageous of all. Her "complexion veil" was tinted green across the eyes, and blush-rose across the cheeks. For Beatrice Lillie, she made a "hands-across-the-sea" hat, with two clasped hands on the front, for the actress to wear both in England and America. Lilly Daché, 1945 collection: shantung day dress. Daché's verve and skills attracted a high-profile clientéle of stage and film stars: Marlene Dietrich, Carole Lombard, Joan Crawford, Marion Davies, Gertrude Lawrence—all the big names. She worked with Travis Banton on Hollywood films, providing the hats to top his costumes, as many as 50 for one star for one movie. Often it was she who stuck Carmen Miranda's towering turbans with birds and fruit, and yet more birds and more fruit. At her New York headquarters, Daché created a setting for herself which now seems the essence of kitsch glamor. Her circular salon was lined with mirrors; she had a silver fitting-room for celebrity brunettes, and a golden one for blondes. For wholesale buyers, she had another circular room padded with tufted pink satin, where she reigned from a leopard-skin divan wearing a leopard-skin jacket and leopard-skin slippers with bells (to warn her girls of her approach, a job later undertaken by her armful of jingling bangles). Not an early riser, Daché conducted her morning's business from her bed, in the style of an 18th-century levée, dictating letters, buying supplies, designing, and interviewing employees while wrapped in a leopard-skin rug (she also had a robe made from the skins of more of these unfortunate cats, lined with shocking-pink felt). Occasionally business would be conducted from the reasonably modest depths of a neck-high bubble-bath. But Daché, like so many fashionable New Yorkers of her day, professed herself never so happy as when digging around in the garden of her upstate Colonial home. Daché was one of the so-called "Big Three" New York milliners of her day, the others being John Fredericks and Sally Victor, and as such exerted a powerful influence on the American millinery trade, designing for wholesale manufacturers as well as for personal clients. Her designs sold worldwide and she embarked enthusiastically on promotional tours, accompanied by mountainous luggage and concomitant publicity. At the height of her fame, Lilly Daché had shops in Chicago and Miami Beach, and employed 150 milliners at her flagship building off Park Avenue in New York City. Daché was a great self-publicist and epitomized the kind of woman to whom her smart American customers aspired. She was chic and flamboyant, and presented herself with self-assured bravado—"I like beautiful shoes in gay colors, with thick platforms and high heels. I like splashy jewellery that clinks when I walk, and I like my earrings big. I am…Lilly Daché, milliner de luxe."